The 3rd National Photography Awards were conferred today by the Honorable Chief Justice of India Shri P Sathasivam to eminent photojournalists at a function held in the National Media Centre. The Hon’ble Chief Justice conferred 13 awards in various categories which included the Life-Time Achievement Award to eminent photographer Shri Rajesh Bedi. Awards were also conferred in the Special Mention Category for both Amateur and Professional segments. 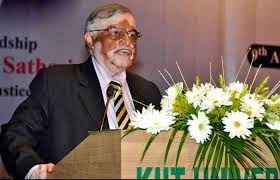 Speaking on the occasion, Hon’ble Chief Justice of India, Shri P. Sathasivam said that due to the daunting sphere of piracy in the domain of photojournalism, professional photographers must be aware of their lawful rights in order to flourish as professionals in their field. While Copyright protection did exist, it was necessary for the photojournalists to register their copyrights for enforcing their rights in case there were instances of infringements. Elaborating further, the Chief Justice stated that the perusal of this process by photojournalists would not only protect their work, it would also register their copyrights making it easier to track down potential infringers and enable them to obtain a license legitimately for their creative work thereby avoiding the hassle of litigation. The Chief Justice also stated that photography had become an integral part of human life and thus could no longer be considered an affluent hobby. The initiative by the Photo Division was an acknowledgement of the vision and effort put in by the pioneers of the Indian Photographic Movement. Speaking earlier on the occasion, Shri Bimal Julka, Secretary, Ministry of Information & Broadcasting, said that through the efforts of Photo Division, the photography as a medium had acquired a new meaning. Digitization had become the accepted norm and technology had become the driving force in this field. The Photo Division through its fully featured systems had brought about innovation in various aspects of photography. The different awards conferred in the various categories was an attempt to capture the growth of professionalism and creativity within the growing dimensions of photojournalism. Appreciating the award winners, the Secretary said that in an age, when almost everyone owns a camera, only a few had mastered the art of using lens to perfectly capture the best moments. It was the endeavor of the Ministry to ensure that the awards encouraged people to take up photography as a profession. The awards were also a testimony to the diversity in India as far as creative instinct for photography was concerned. The Life-Time Achievement Award has been conferred on Shri Rajesh Bedi, a renowned photographer of the country, who has made long and outstanding contribution in the various fields of photography at the national and international level. Shri Bedi is regarded as one of the finest photographers of Indian Wild life. His photographic work has also contributed in reflecting the various dimensions and development of the society. His works have appeared in nearly all distinguished international magazines such as National Geographic, Life, Geo, The Audubon Society Book and in various encyclopedias. In the Professional Category, the ‘Best Professional Photographer of the Year 2012-13’ has been given to Shri J. Suresh, a renowned photographer and photojournalist who has made commendable accomplishments in social, environmental and wild life photography. Currently, working as Chief Photographer in Malayala Manorama Daily, he is winner of numerous national and international awards including Press Council of India National Awards for Excellence in Photo Journalism 2013. Special Mention Awards (Professional) have been given to Shri Atul Yadav, Shri Dinesh Shukla, Shri Chauhan Pravinsinh R, Shri Sudipto Das and Shri Dipayan Bhar. In the Amateur Category, the ‘Best Amateur Photographer of the Year 2011-12’ has been given to Shri Kingshuk Chakravarty, a computer science researcher. He focuses on street and documentary style of photography and has been awarded many accolades including People & Cultures Runner-up in London School of Photography, Performance Award in HPA 2013; 2nd Prize in Indian Himalayan Photography Competition 2013. Special Mention Awards (Amateur) have been given to Shri Sandipan Majumdar, Shri Alok Avinash, Shri Asis Kumar Sanyal, Shri Devendra and Shri Avijit Roy. The theme for Professional Photographer category was “Women Empowerment” while Amateur Photographer category’s theme was 'Indian Culture'. These awards involved cash prizes of around Rupees 17 lakhs with the “Life Time Achievement Award” winner receiving Rs.1,50,000/- , while the “Best Photographer of the year” in the Professional and Amateur category getting Rs.1,00,000/- and Rs.75,000/- respectively. The “Special Mention Award” winners received prize money of Rs.15,000/- each in Professional, and Rs.10,000/- each in Amateur category. Besides this, Medals / Plaques, Citations were also conferred on all the Award Winners.